A loyalty program is a popular marketing strategy that encourages your customers to continue buying your products or using your service. 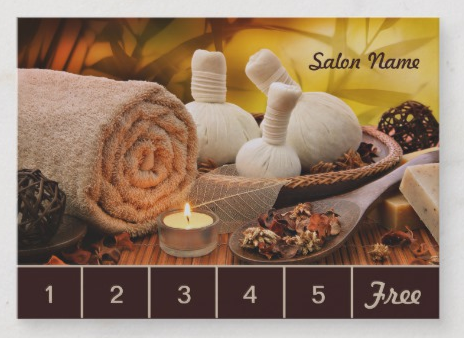 Designing your punch cards using elements that align with your industry or brand will help your customers quickly remember them, better encouraging its use by keeping it front of mind. One efficient way to run a loyalty program is by giving digital punch cards, so your customers can always have them handy. 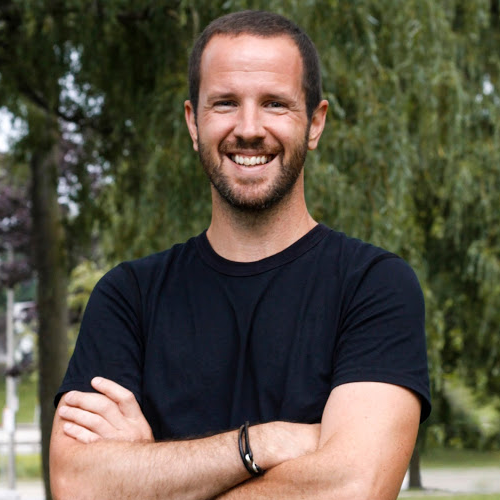 Loyalty program software like CandyBar allows you to easily set up rewards, track the progress of your customers, and assign them digital punch cards, all from a small-business friendly platform. All your customers need to do to join is give you their phone number, confirm via text, and they can start collecting rewards right away. Click here to try it free. 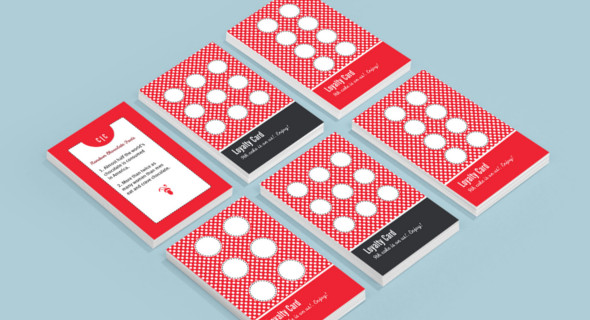 We curated a list of 28 punch card templates, examples, and tips you can use to come up with your own design to get the most out of your loyalty program. 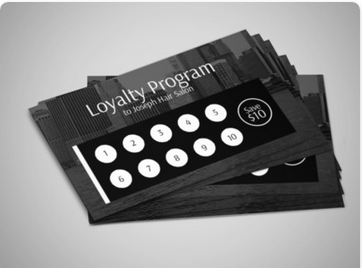 A very simple loyalty card design that can adapt to fit any type of business. The smart use of font type and color over a chalkboard background gives it an edgy feel which can be easily customized to match your brand’s colors. This loyalty card is designed to exude sophistication. Long black rectangular shapes remind you of piano keys and elegant hands while the classic black white and gold colors complete the sophisticated feel any woman would love. The layout also makes it easy to access the designated punch hole portion of the card. Eye-catching and playful, this loyalty card is undeniably from a sushi restaurant. The entire design, from the color to the punch hole shapes, will easily remind you of freshly caught seafood. It would be easy to spot this loyalty card from all the other cards in your wallet. This template makes use of grunge texture for an earthy look. Combining it with muted colors and handwriting fonts completes the organic feel that’s very appropriate for a health and wellness business. 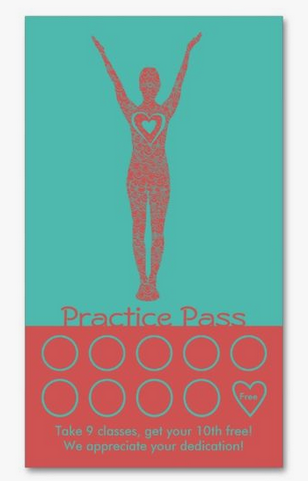 Replace the image with your logo’s silhouette and apply the same muted tones to your brand color, and find out if this loyalty card design works for you. 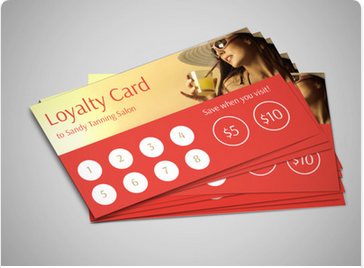 How your loyalty card looks is as important as the rewards you offer to your customers. These designs will help ensure that your business continues to impress and provide the best experience to your customers. 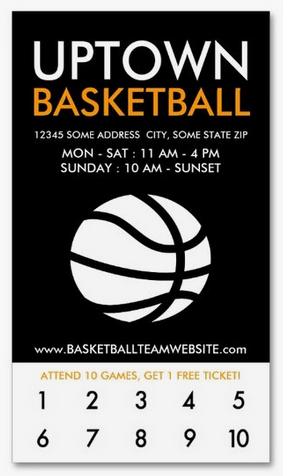 This design works on glossy hard paper typical of admission tickets. We like how the card includes details such as business hours and a website address that customers can check for event schedules on their mobile. Use this for businesses that offer venues for sports and performances. If you sell novelty items, your loyalty card should tell customers that at a glance. This template is playful from the colors to the design, which you can customize to fit your brand. Keep the back of the card plain but with just your logo and contact details. One colorful side to display your style and the other in a simple white background. 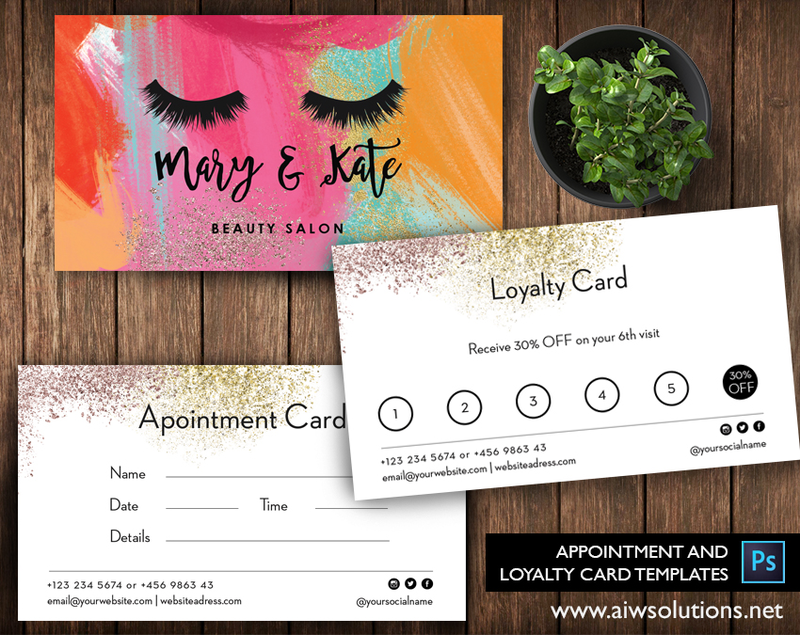 We love how this template can be both an appointment card and a loyalty card in one with the right layout. Consider adding your logo in plain black outline while using your brand colors for the background. The image in black and gray theme is associated with sophistication and fits perfectly with the idea of a modern woman. Replace the photo with one of your own, perhaps of your salon’s facade for customization. If you’re a hairstylist, add your name to build better relationships with your clients. As an auto detailing business, you will have clients who will frequently visit your shop. A simple design for your loyalty card will do, but having a stand-out design makes it easier for customers to pick your card out anywhere. 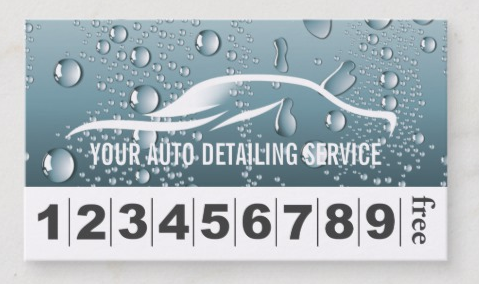 This one uses large fonts and a simple car silhouette, but the life-like water droplets make it unique. Why go physical when you can go digital? 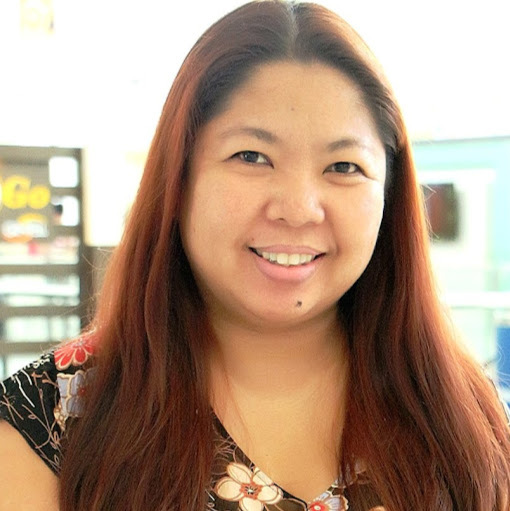 CandyBar has created a small business-friendly rewards platform that is completely online. You can choose your rewards and track visitors from your smartphone or computer, and all you need to do is ask for your customer’s phone number. They’ll get a text to confirm, and they are signed up! Try it free for 30 days. 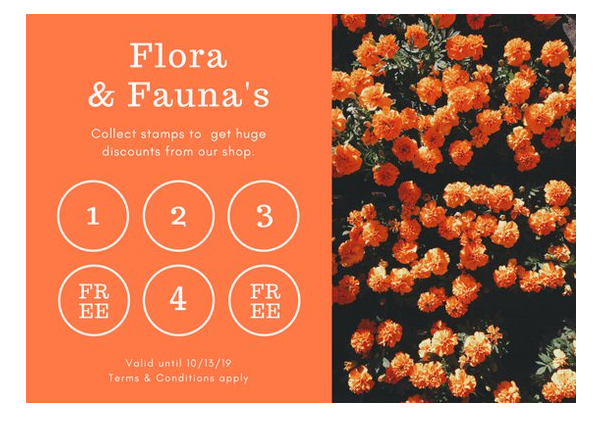 Flower shop marketing materials are always pretty to embody a floral feel, including loyalty cards. Notice how the color theme for this design matches the colors on the flower image, so make sure to choose flower photos that fit your brand identity. As a fast food restaurant owner, it can be tempting to add photos of your entire menu on all your marketing materials. But you don’t want the purpose of your loyalty card lost in a noisy design. Choose the best-selling food on your menu, pair it with large fonts for the details, and make the colors bright and attractive. A salad and bistro loyalty card can get lost without a cleverly branded design. This template’s design gives a fresh and vibrant feel while making sure the details can be easily read. 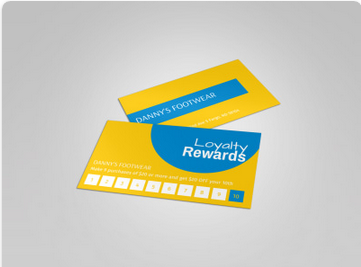 It uses bright yellow fonts to emphasize important details that should be found in any loyalty card. 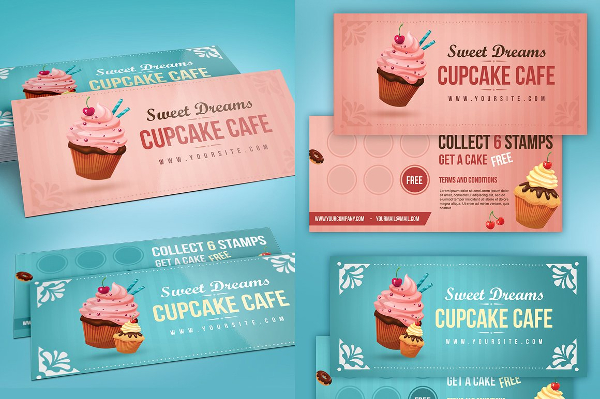 There are enough cupcake varieties to cater to all kinds of demographics, so your loyalty card must be designed in the same way. This template provides an example where the sweet cupcake type reflects the design. 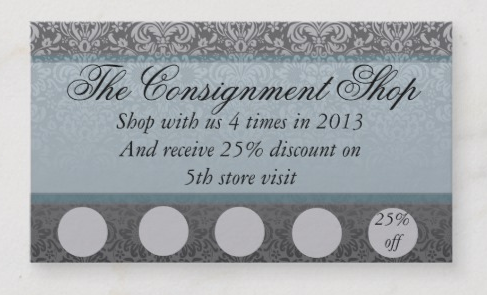 Consider using a real photo of your product and customize the background as well as the fonts. This is a very straightforward design for a tanning salon loyalty card. Notice how the template makes use of the color brown, with an appropriate stock image to help emphasize what the card is for. Be creative with the image and replace red with your brand color. 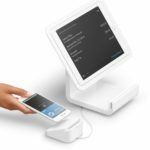 Square covers all of the features you are likely to require in a POS software, including setting up a rewards program that allows you to provide your customers with digital punch cards to incentivize them to purchase more frequently. Best of all, Square is completely free and comes with no fixed monthly cost for credit card payments. Click here to sign up for a free Square account today. This pinafore design is generic yet stylish enough for a number of businesses. 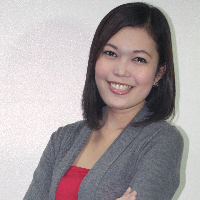 The red and white color theme is eye-catching (which you can change to better fit your brand). 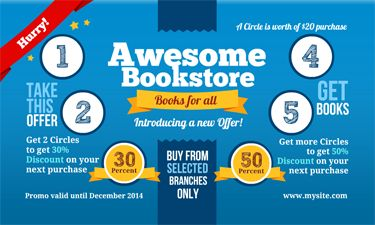 Include a friendly message to get your customers coming back for more. This template is simple, but the contrasting colors make the design stand out. Try replacing them with those of your brand and add your logo to match the font style. 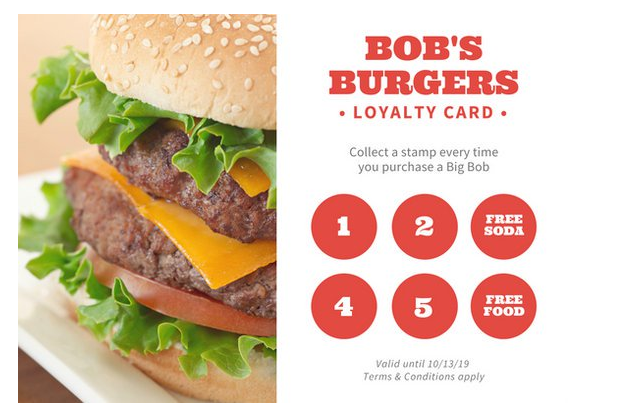 The large image makes this loyalty card impossible to miss. It’s important to choose an image that’s recognizable to your brand and keep the caption simple on the side with the photo. Keep the opposite side clean and consider adding an appointment form along with your contact details. 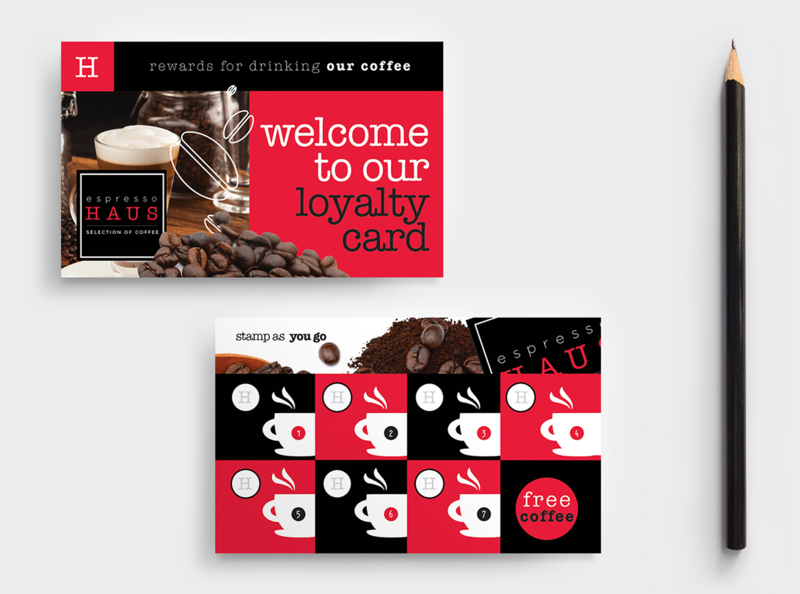 Large coffee shop businesses are famous for their well-crafted marketing materials, including ones for their loyalty programs. This template shows how it can be done with enough creativity in the design at minimum cost. However, remember to make sure that important details don’t get lost in the layout by using shapes and colors that stand out. Your clients will love this unique and organic design. The earthy colors, the simple image and handwriting font give off a personal touch that works best for a dog grooming business brand. 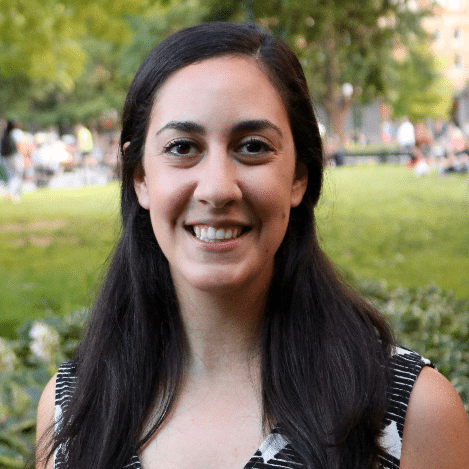 It can also be used by pet sitters, house sitters and child carers, where clients look for a more personal approach in their service. 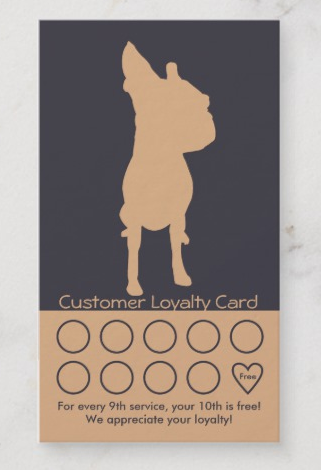 This loyalty card template is not the simple kind. 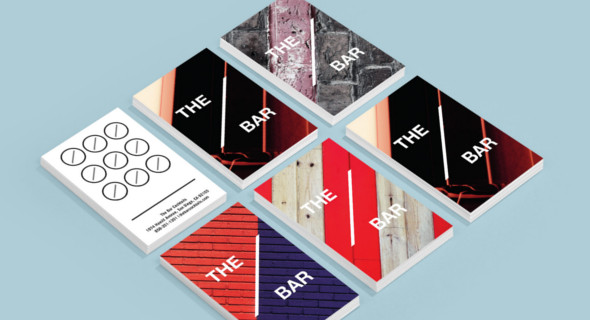 The activity is more engaging—which calls for an equally engaging design. More colors are used to accent key points of the loyalty program. 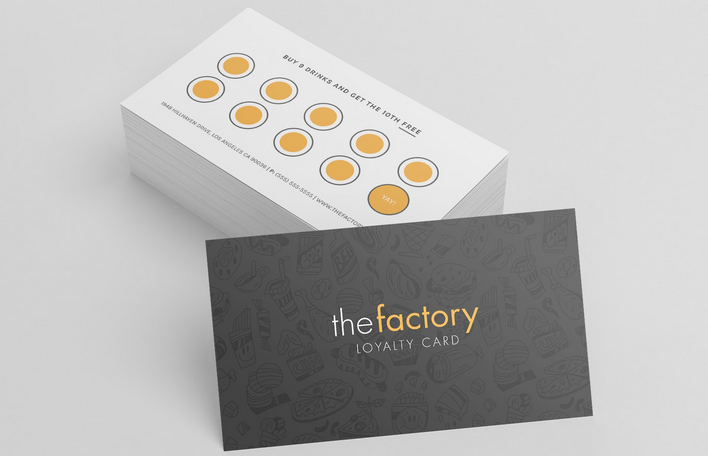 This can also be used as loyalty card template for arcades, ice cream shops and other establishments that want to offer more than the standard loyalty card. 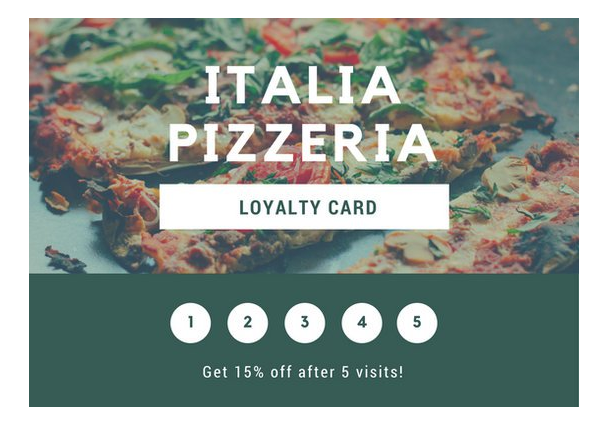 Pizza loyalty cards are popular because everybody loves pizza. Make sure that your fonts don’t get lost in the images and overall layout so your customers will want to engage more. Remember to that your design should show off your most popular dish to keep them coming back for more. If your business is into artisanal, or special handcrafted items, this elegant loyalty card template will suit best and will easily fit any kind of budget. Keep it simple with the colors and use beautiful fonts. You also have an option to use textured paper.to complete the one-of-a-kind look that matches your products. 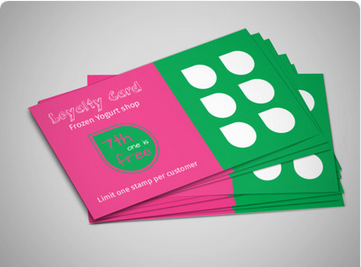 This yogurt shop loyalty card template combines a simple layout with fun shapes, colors and fonts to stand out. When customizing the design to reflect your brand, make sure to keep the design neat and the overall feel vibrant. 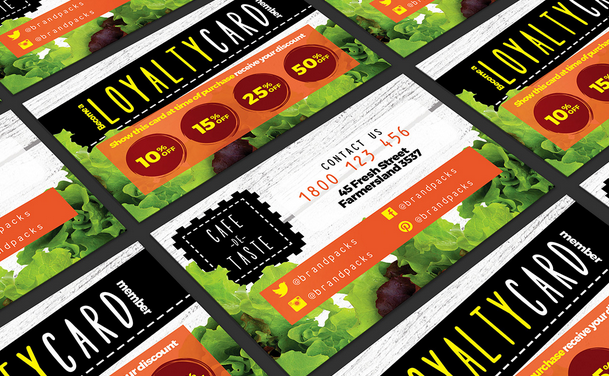 This modern design combines both a business card and loyalty card in its layout. The images and colors suggest a hint of exclusivity that loyal customers are looking for in this kind of establishment. Achieve this look by keeping the paper texture glossy and words minimal. 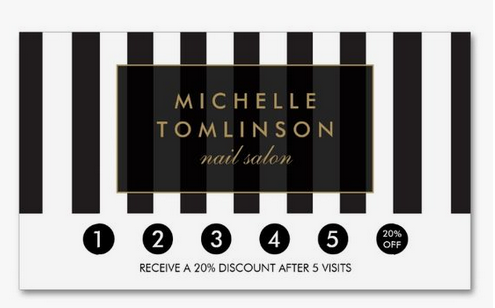 Once you’ve got your design all set up, make sure that your loyalty cards are professionally printed with Vistaprint. Vistaprint is the business card provider of choice for small businesses, with its affordable price and great turnaround time. 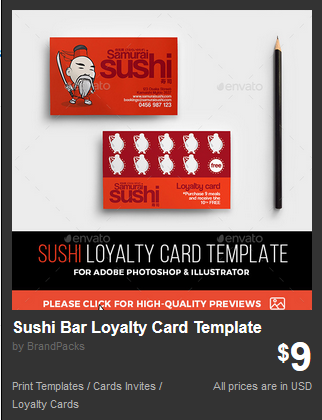 And if you still haven’t finalized your loyalty cards design, you can easily choose from their over 10,000 templates or get help from one of their professional designers. 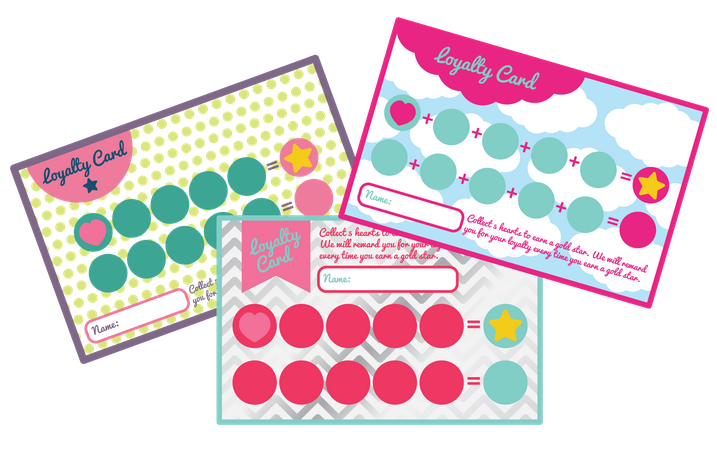 Did you find your personal favorite punch card template? Let us know in the comments!